Many presuppositions come to mind when you hear the headline, "Illinois Family Sells Company, Gives 6.6 Million Dollars in Bonuses to Employees." But I ask you -- no I challenge you -- not to jump the gun, judge or fill your head with preconceived notions about the Spungens or why they decided to be so generous. Laurence and Florence Spungen and their four children sold their PEER Bearing Company last fall and gave the money to employees as bonuses (some bonuses were six figures) based on years of service. Sure, many of the 230 employees needed the cash. Who wouldn't during this time of economic turmoil (OK, maybe former financier "Bernie" Madoff, but I won't go there), but that wasn't the impetus for the generosity. In a time when we are inundated with bad news about our economic landscape, corporate greed and bank bailouts, it was refreshing to meet such an authentically kind family with solid values -- a shining example of corporate responsibility (listen up corporate America). A family who cares as much about their employees as they do their own family and treats them with dignity and respect -- traits not often heard of in big corporations. When a GoInspireGo.com viewer sent me an e-mail about the Spungen family from Waukegan, Ill., and told us about their generous deed, we were intrigued and wanted to know more about them. Who are they? Why would they give millions of dollars away during the economic downturn? But it didn't take me long before we found out why the Spungen family was so caring and sharing. What I didn't expect (before even making any contact with the family) was that they'd be so down-to-earth, genuine and extremely compassionate. While taking a tour of the Spungens' other business, PEER Chain, unlike owners of many other big companies, the Spungen family knew the names of every employee, how many children they have... and their stories. When I asked the family my favorite question of all time -- "WHY?" -- the Spungens explained it was "just the right thing to do." When the family decided to sell their ball bearing company, the family knew they wanted to give some money to the employees to thank them for their dedication and hard work. They just didn't know how much. After figuring out an equation based on years of service, the family got right to work on the big surprise. The family hand-signed every "Thank You" card. Printed on them were their names and years of service and a heart-felt message of gratitude. When the Spungens called a company-wide meeting to tell the workers about the sale, Eddie S., an accountant for more than 30 years with PEER, said "I thought we were going to get laid off... But I was excited to see the large sum of money and I was happy to see that I was being compensated for my loyalty." The family said, "Many people cried, other employees say the money helped save their home from foreclosure." "Sure we all wanted to do it, but there we just didn't know how much." Laurence Spungen, former PEER Bearing CEO, joked, "After we gave the bonuses, they had to check to see if I was still standing." Glenn Spungen, Vice President of Sales and Operations, said the workers were an integral part of their success, so they wanted to compensate their employees for their loyalty and "blood, sweat and tears the workers put into the company." Just have a conversation with the Spungens and you'll realize that kindness and generosity is a huge part of the Spungen legacy. The family also created the Laurence and Florence Spungen Family Foundation, dedicated to cancer research and Jewish causes. Every year, the children and grandchildren are required to research and donate to a charity of their choice. Wow. If we could all plant the seed early, what a difference it would make in our community and our world. "How much money do we really need?" said Debbi Spungen. "I want others (big businesses) to do the same, if they can." In such turbulent economic times, when all we hear about are corporate crooks and Wall Street woes, it was refreshing to meet a family who humbly built their empire (through lots of hard work, determination and passion) from the ground up and used their success, resources and talents to help their employees; the very people responsible for putting in the elbow grease, talents and time in the well-oiled multi-million dollar empire. You may remember the Spungens from my last blog and video. When they heard about Jorge Munoz (NYC school bus driver responsible for more than 70,000 meals) they wanted to help him. "We want to buy him a new refrigerator and stove," the family said. They stuck to their word. 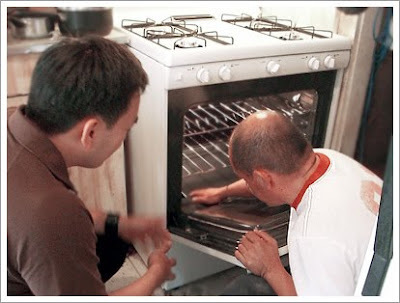 I recently hopped a flight to meet them in New York to deliver the stove to Jorge. It was amazing to see how this experience, though www.GoInspireGo.com unfolded. Here you have two families, the Spungens and the Munozes. Both come from opposite ends of the financial spectrum, yet their values and characteristics so aligned; compassion, good will and philanthropy. 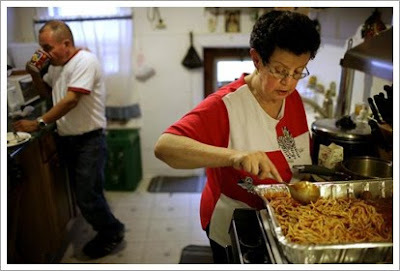 So to the Spungen and the Munoz families -- we salute you. Thank you for helping elevate humanity. 1.) Volunteer, it's free, fun and a great way to meet people. Partner up with a friend or sign up a group of friends. I've volunteered at the San Francisco Food Bank and packed food with some friends -- we had a fabulous food packin' time. Try it! 3.) Ask, ask, ask! It's the little things that count most -- especially during these tough economic times. Use family, friends and neighbors as a sounding board to see what they think you can do to help others. So many people I connect with say, "I wish I could do more, but I don't have time or I don't have anything to offer." Get of the humility boat and ask folks in your circle, they may give you insight on how you can help. That's how I got my website started! Lisa Klein neatly packs baby booties, bibs and books in boutique style boxes labeled "Baby Boy" and "Baby Girl" every month with her two kids. But the cardboard boxes aren't for her children. For the past two years, Lisa has packed more than 20,000 pounds of kids clothes for underprivileged newborns, through her non-profit LovedTwice.org, kids that would otherwise leave the hospital without the baby basics. There's enough clothing in the 10 pound boxes for the baby's first year. There are gently used onesies, socks and every box has 'something extra's such as diapers or a baby Bjorn. "It's all about the babies," says the Oakland mother of two, "It's to keep them warm, clean and cozy no matter what's going on in their mothers' lives." "This 15-year-old girl was getting ready to leave the hospital and she asked the nurse if she could bring home the blanket, she didn't have anything to keep her baby warm." The idea was born during one of the worst natural disasters in U.S. history. Lisa was moved after Hurricane Katrina ravaged New Orleans. "We saw that people lost everything and were camping out in front of a church. My daughter and I wanted to help. We didn't know how. We went on the internet and on Craigslist. What struck me, was that they needed baby clothes, I had baby clothes." That's when Lisa put two and two together and came up with LovedTwice.org. Starting in her attic, where she pulled dusty boxes and bags full of baby items Loved Twice emerged. She then asked friends, family, neighbors and strangers to drop off their baby goods on her porch. What she wasn't prepared for was the outpouring of support from her community. Thousands donated items, crowding her porch. The one-time clothing drive turned into this amazing non-profit. More than two years and two thousand boxes later, the busy mother of two says it was hard to keep her head above the mounds of baby items and wanted to close up shop. Lisa knows how important the baby's first developing year is also how overwhelming caring for children can be. Adding to this was the massive responsibility of orchestrating a non-profit. Lisa admits, "Last month, I had to take a step back. I came back from an extended vacation and there was 800 pounds of clothes waiting for me. I was like, I can't do this anymore. I've never thought that before... and within an hour of thinking that, I received a call from you." "THANK YOU!" She says with a smile. That kept me going, and you in turn will help thousands of kids that will continue to get the baby boxes. She explains, "then within that hour, a woman called me and said she and her coworkers wanted to volunteer and help pack." Chills tingled through my body, because lately, I've been feeling over-whelmed too. I run a non-profit GoInspireGo.com and I teach full time at the Academy of Art in San Francisco and also one class at my alma mater, the University of San Francisco. Oh did I mention, I also produce online videos for local stores and companies and am in the process of writing a childrens book? And of course, I blog for The Huffington Post and believe it or not, I also try to have a life too. I recently wanted to take a hiatus from my busy life. I was ready for a "Calgon take me away"–ok, not that dramatic (but you get the point.) I wanted to take a break and didn't know if I could continue my erratic to-bed-at-3am-and-up-at-5am schedule and still get all my work done. I began spending more time with my MacBook than with my family and friends. –I inspired Lisa and she inadvertently returned the favor by uplifting my spirits. Now, underprivileged infants will continue receiving help through Loved Twice. It's almost miraculous in scope of how much goodness is coming out of this experience! What you give to the world, you get back ten-fold. So what I ask you is, what have you done to improve the life of someone else? If the answer is "I don't know," then GET CRACKIN'! Spring is in full swing -- and I've got the allergies to prove it! Aside from the sniffles and sinus pressure, I welcome this season, this change, with open arms. This spring time, I'm lucky enough to be able to travel to NYC and upstate New York to enjoy the myriad of cherry and apple blossoms that line several streets of this concrete jungle, the food, fashion (I love people watching) and the calmness of Upstate. The colorful blossoms scattered everywhere are constant reminders to slow it down... and enjoy them... because they do connect us to something bigger -- the universe and its energy; sun, water, soil, the people -- and their stories. If you asked me a year ago, I wouldn't have even imagined I'd be laid-off and here in NYC people watching, meeting up with new and old friends. It's truly been a serendipitously busy vacation. This trip was truly rewarding both personally and professionally. I only planned to come, hang out with some friends in NY, then take a train along the Hudson River to Poughkeepsie to visit my friend Shannon. I should've known the Big A isn't the place for just sitting, relaxing and vacationing. The energy is amazing, but at the same time, it could be draining. A recruiter for the CBS Network, was inspired and contacted me after seeing the Go Inspire Go website and wanted me to meet a few folks under the CBS tent. I did not expect the amazing events to ensue. First off, my agent contacted me and said, you're in NY, I'll send the other networks your reel and website. That's when I got one call after another -- ABC, NBC and then back to CBS -- for more meetings. Wow. I didn't realize that even the recruiters would be inspired by this website. And another amazing thing happened... I met a true life angel/hero and another life-long friend, Sara. I came here on the lookout for a family who cooks over 120 meals nightly and selflessly gives them out to the homeless people under the subway tracks in Jackson Heights, Queens. I heard of this story, by a viewer, Terrie in Chicago. I looked high and low on the internet, and asked Terrie to research where she saw it, but to no avail. Oh well, I'll surrender to the powers that be and if it's meant to happen, then I'll do it, if not, I can always come back to New York to do this story. Then, last Wednesday night, I met a new friend, Sara, who was a laid-off producer of one of the networks. (Thanks Ramy for connecting us over dinner.) She told me about the same story, that she had read about in the newspaper. Oh my gosh, I knew it wasn't a coincidence and that I had to try my best to find this family and do this story. Sara and I researched, Googled and asked around, but no luck. Then, a few hours later, we found it through more research on the Internet. It just so happened that the food delivery location, was down the street from my friend, Ramy's apartment in Queens where I was staying -- A BLOCK AWAY!!! I was so excited. So was Sara. The man we interviewed is named Jorge Munoz. He is a school bus driver by day, and after his shift, his second jobs begins. He and his family start grocery shopping and cooking away. Together, they prepare over 120 hot meals, pack them, and then drive them over to the subway stop every night at 9:30. They've been delivering hot food to the needy for the past four years, only missing one day, due to a snowstorm. After the interview, I felt chills and overcome with emotion. I told Mr. Munoz that I was so honored to meet and spend time getting to know him and his family. My eyes filled with tears as I left his home. Mr. Munoz only makes $700 a week. The donations through his non profit, www.anangelinqueens.org and donations from folks in the community isn't enough to feed the growing army that meets him under the subway -- so he has to spend $250-$300 of his own money EVERY WEEK to make sure everyone is fed. WOW! It's so funny how, what's meant to be just is. It just works out -- despite all the obstacles in the way. We had no equipment, no idea of who or where Mr. Munoz was, but still, something bigger than us, connected all the dots. . . Sara told me, "When I met you over dinner and you invited me to do this story, I couldn't sleep. I was in a funk, after being laid off for the past three months, and was so excited to participate in a story that I cared about so much. I'm so excited, I have no words to describe it." Although this laycation was surprisingly busy and filled with so many pleasant surprises, I also realized it was because I'm at a different place in life and in my career. In the BIG Apple, I was also "Aware," on the subway, while walking throughout the city, and while meeting up with faces new and old. I realized that when you are present and on your path to doing good, with the resources and talents you possess, great things come, 20-fold! My mantra this year is, "KNOW YOUR POWER -- AND USE IT!" AMAZING! 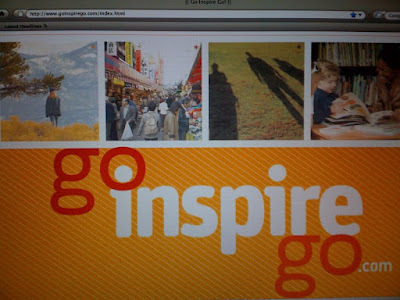 I'm excited to announce the new website: www.goinspirego.com - Thanks to my webmaster, the very talented, Lorelle Graffeo! This site is the hub of all the latest and greatest surrounding this movement. You'll find the links to the YouTube Channel & Blog, as well as everything you need to know about the MISSION & VISION of GO Inspire GO - inspiring stories, people who create them and how you can take part! NOTE: We were recently featured on some local news outlets, so when you visit www.goinspirego.com, please make sure to click on the "Welcome" tab, then "News & Media"
Several national news organizations may also feature this site and the movement its created!